Club drug ketamine cures depression instantly: How? (CBS) What's the latest recreational drug to make its way to the medical field? Ketamine, also known as "Special K." The club drug, typically used by veterinarians as a cat tranquilizer, is said to provide patients an "instant" relief from depression, according to a new study. Doctors at Ben Taub General Hospital in Houston are now experimentally using the drug to treat some patients who come to the emergency room with suicidal depression, NPR reported. Is there an antidepressant shortage we don't know about? Dr. Anu Matorin, medical director of the Psychiatric Emergency Center at the hospital, told NPR that antidepressants may help suicidal patients eventually, but often take weeks or months to kick in. During the critical few days when very depressed patients have suicidal thoughts, they may be a threat to themselves or to others and are sometimes admitted to inpatient units. That's why researchers at Ben Taub are among a growing number of scientists trying to transform psychiatric care - with the help of the club drug. 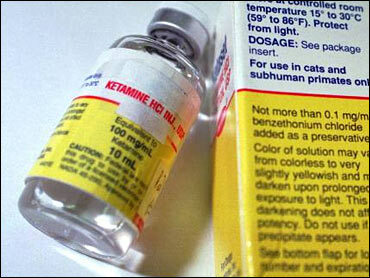 Previous research suggests the anesthetic ketamine could help treat depression almost instantly. Dr. Sanjay Matthew, associate professor of psychiatry at Baylor College of Medicine leads the ketamine research program at Ben Taub General Hospital. "The focus is on really rapidly helping someone get out of a depressive episode," Matthew told NPR. "We can take care of a migraine in hours," added Dr. Carlos Zarate, a ketamine researcher at the National Institute of Mental Health. "So why do we have to wait weeks or months with depression?" This isn't the first report of ketamine helping people with depression. A 2006 study of Zarate's found a single intravenous dose of ketamine helped relieve treatment-resistant depression symptoms within 2 hours. How does ketamine help depressed patients? Those who take the drug typically say, "'I feel that something's lifted or feel that I've never been depressed in my life. I feel I can work. I feel I can contribute to society.'" Zarate told NPR. "And it was a different experience from feeling high. This was feeling that something has been removed." Ketamine works differently than other antidepressants. While pills like Prozac boost the levels of the neurotransmitter serotonin to make people feel less depressed over a period of time, an injection of ketamine works on an entirely different neurotransmitter, glutamate. It blocks the receptors critical for receiving glutamate's signals which quickly improves the brain cell's electrical flow. That in turn reduces depression, according to the NIMH. Dr. Asim Shah, who directs the mood disorder program at Ben Taub General Hospital, told ABC News the researchers hope the effect lasts. "Will it cure depression for a year or longer? I don't think so," Shah said. "But we're hoping it will work for a few months"
But that doesn't mean people should self-medicate with the illegal drug. Ketamine is popular and "dance clubs and raves," and can be injected, consumed in drinks, or added to smokeable materials, according to the U.S. Drug Enforcement Administration. Some users fall into a dissociative "trip" on the drug, which is called a "K-hole." Dr. Robert Glatter, emergency medicine physician at Lenox Hill Hospital in New York City, said the drug has similar effects to PCP, and may cause visual hallucinations, vivid dreams, confusion and disorientation, increased salivation, and problems with heart rhythm and breathing. Besides animals, the drug is sometimes administred to people along with a sedative in the hospital for patients undergoing painful procedures.